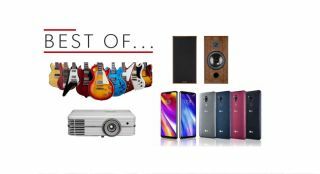 Best of the Week: Gibson files for bankruptcy, LG G7 ThinQ smartphone, Q Acoustics 3010i and more | What Hi-Fi? This week Gibson filed for Chapter 11 bankruptcy in the US, LG unveiled its new G7 ThinQ smartphone and Apple revealed its financial results for the last quarter (profits were substantial). For reviews we have two speakers at opposite ends of the price range, in Spendor's Classic 2/3 and Q Acoustics' budget 3010i bookshelft speaker. There's also Optoma's budget 4K UHD40 projector. It's also new issue week, with the June issue of What Hi-Fi? on sale. It's our look at the 2018 World Cup, with reviews of the best TVs to buy plus all the latest happenings in hi-fi and home cinema. Don't forget, you can subscribe to the magazine, or buy the iOS, Android or Kindle editions. MORE: June 2018 issue on sale now! Gibson has filed for bankruptcy in the US, with plans to refocus on its musical instrument and equipment business. The company is mired in debts of $500m, which it blames on poor sales in its consumer electronics division. The re-organisation of the business will affect its consumer audio arm, which includes brands such as TEAC, Stanton and Cerwin Vega. LG's new smartphones has designs on being the world's smartest. One such ability of the G7 ThinQ AI involves its camera, which analyses the frame and recommends the optimal shooting mode. it also comes with a 3000mAh battery, 4GB RAM and a 6.1in QHD+ screen with a resolution of 3120 x 1440. Apple published its financial results for the second quarter of 2018 and it was mostly good news. The company posted a quarterly revenue of $61.1bn, much of which was down to revenue from iPhone sales. The wireless AirPod headphones were seen as success, but the home products division (which includes the HomePod and Apple TV) saw reduced revenue compared to the previous quarter. Is Sonos readying a smart soundbar? The 10 most popular reviews on What Hi-Fi? Spendor's Class 2/3 standmounts are retro efforts that produce a fantastic sound. They offer impressive scale and authority, with a presentation that is tonally even - and, in light of the retro looks, the build is fine too. We can't think of an alternative as good as the Spendors at its price level. Optoma's UHD40 is a 4K affair at a budget price. It serves up an image with colours that are vivid, yet realistic, with plenty of detail and smooth motion. Our only quibble is that black detail could be better. For those who want a 4K projector without shelling out a fortune, the UHD is a prime choice. Q Acoustics has revamped its 3000 series of speakers and the first out of the blocks is the 3010i. And it is a refined and detailed effort that boasts energetic sound. They're unfussy when it comes to positioning and produce a good low-end performance. They lack the scale of some (larger) rivals, but if you're looking for a small speaker this is an exemplary budget effort.